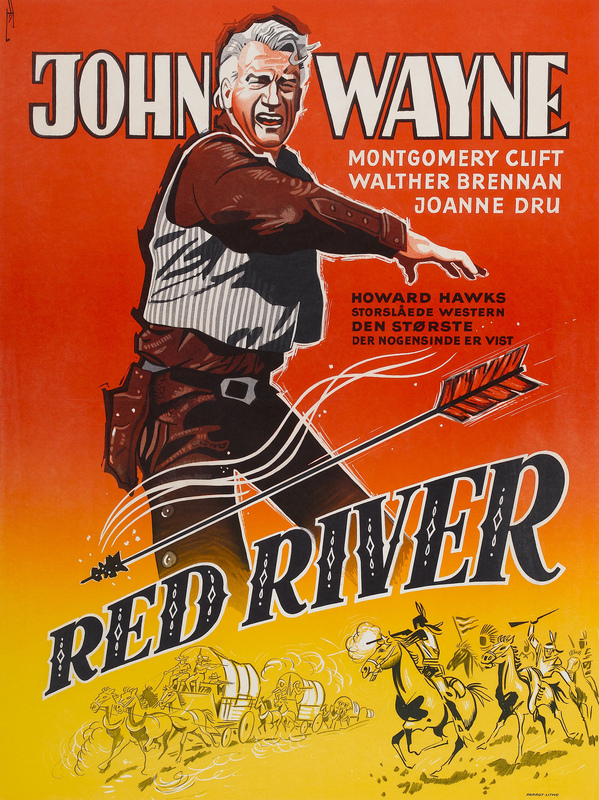 Red River is a 1948 Western film directed and produced by Howard Hawks and starring John Wayne and Montgomery Clift, giving a fictional account of the first cattle drive from Texas to Kansas along the Chisholm Trail. The dramatic tension stems from a growing feud over the management of the drive, between the Texas rancher who initiated it (Wayne) and his adopted adult son (Clift). The film's supporting cast features Walter Brennan, Joanne Dru, Coleen Gray, Harry Carey, John Ireland, Hank Worden, Noah Beery, Jr., Harry Carey, Jr. and Paul Fix. Borden Chase and Charles Schnee wrote the screenplay, based on Chase's original story (which was first serialized in The Saturday Evening Post in 1946 as "Blazing Guns on the Chisholm Trail"). In 1990, Red River was selected for preservation in the United States National Film Registry by the Library of Congress as being "culturally, historically, or aesthetically significant." In June 2008, AFI listed Red River as the fifth-best film in the western genre.